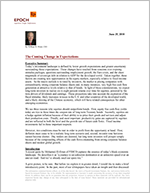 The Coming Change in Expectations - Epoch Investment Partners, Inc.
Today’s investment landscape is defined by lower growth expectations and greater uncertainty surrounding those expectations. These changes have resulted from concerns over expiring stimulus packages, questions surrounding employment growth, the Euro crisis, and the sheer magnitude of sovereign debt in relation to GDP for the developed world. Taken together, these factors are creating new opportunities in the equity markets, especially relative to fixed income assets. As the macro outlook is re-rated by investors, the market is pricing companies with extraordinarily strong corporate balance sheets and, in many instances, very high free cash flow generation at attractive levels relative to that of bonds. In light of these considerations, we expect long-term investors to realize six to eight percent returns over time for equities, powered by the twin drivers of dividends and earnings. These projections take into account the expiration of the fiscal stimulus, likely increases in taxes in the U.S. and other countries of the developed world, and a likely slowing of the Chinese economy, which will have related consequences for other emerging economies. We see three reasons why equities should outperform bonds. First, equity free cash flow yields today are two to three times the coupon rate of long term Treasury bonds. Secondly, equities are a hedge against inflation because of their ability to re-price their goods and services and adjust their production costs. Thirdly, and most important, productivity gains are captured by equities and are reflected in both the level and the growth rate of future cash flows. Fixed income investments fail in these important respects. However, two conditions must be met in order to profit from the opportunity at hand. First, deflation must cease to be a realistic long term scenario and, second, investor time horizons cannot become shorter. Day traders are doomed, but long term investors will prosper simply because of the compounding effects of the cash flows emanating from strong corporate balance sheets and modest global growth. A grim picture, to be sure. But before we explore it in greater detail, I would like to make a brief introductory point. In the past, most of our whitepapers have taken an insight and then discussed its consequences and extrapolated its related investment options. This paper is similar in structure but requires the reader to have a broad context of history and finance. As background, I recommend two books in particular: This Time is Different by Carmen Reinhart and Kenneth Rogoff, and A Demon of Our Own Design by Richard Bookstaber. The former is an outstanding empirical study of 800 years of financial crises and their aftermaths. The latter refers to the rise, use, and abuse of derivative securities. Both books are must-reads and perfect for August vacations. But let us return to the matter at hand: the current global financial crisis and its fallout. In order to arrive at a true understanding of this subject, it is important to understand how an asset is priced and the two factors that determine its present value: the expected return from the investment and a measure of the uncertainty surrounding that expected return. Both are impacted by the “journey” on which we now find ourselves. With respect to the equity market, for instance, our performance forecasts consist of a return accompanied by a measure of uncertainty often expressed in terms of probabilities. For example, over many decades, the S&P 500 has an average return of 10.3% with annual fluctuations ranging from plus 52.6% to minus 40.3%. Hence, our annual market forecast incorporates the mean return of history (10% e.g. ), followed by a range of returns expected for the upcoming year (plus or minus 36%). As one standard deviation of returns has historically been just over 18%, this range covers 95% of the possibilities (i.e. two standard deviations). The VIX1is often used by investors as a proxy for this number. When it is low, the range surrounding the mean expected return is low, and vice versa. History shows a mean return for equities of 10%. But what about the future? To arrive at an estimate, there are three – and only three – variables we must consider: dividends, earnings, and P/E ratios. Let’s begin with dividends. The certainty of today’s cash yield is just over 2% for the MSCI. Now let’s add an estimate for earnings growth. Over the long run, earnings grow at about the same rate as nominal GDP. So if one believes global real GDP will grow at three percent and will be accompanied by inflation of two or three percent, the earnings growth rate will be five to six percent. Remember, real GDP reflects only two factors: the growth rate of the working population and the productivity of that population. Productivity is influenced primarily by technology, scale, and leverage. Suffice it to say that leverage can affect both the number of people employed and productivity measures, positively on the way up and negatively on the way down. With the estimates of dividend yield and earnings growth rates in hand, we must now address the valuation component: the P/E ratio. We know interest rates are inversely related to P/Es. Indeed, the correlation coefficient (r) is remarkably high at a negative 0.8 over several decades. If we square that number, we obtain what statisticians call the “coefficient of determination.” With an “r2” of 0.64, this number implies that interest rates explain almost two-thirds of the movement in P/E ratios over time. Other determinants include industry or factor influences, not to mention geopolitical concerns (think Euro issues, Mid East, sovereign debt, etc.). Nevertheless, interest rates matter most. If we are agnostic about changes in P/E ratios, then our long term outlook for equities as a whole would be seven to eight percent under these assumptions. This is certainly pretty attractive in a world where allegedly credit risk-free bonds generate less than half that number. Also, remember that equities provide a hedge against inflation and capture productivity gains. No other asset class captures both elements as effectively. It is true that rising inflation will result in lower P/E ratios (just look at the 1970’s) but earnings will grow faster as inflation works its way into the pricing of goods and services and ultimately earnings. So far, we have suggested a future return of seven to eight percent for stocks2accompanied by the historical variance of 18 percentage points (one standard deviation of uncertainty surrounding our mean expected return). But what happens when that mean return for equities is lowered and the uncertainty measure rises to a higher level than its past average? The clearing price – that is, the level of the stock market – will drop to reflect the changes in these two variables. In fact, this is already taking place. In April of this year, stock markets were reflecting global GDP growth rates of five or six percent and the variance (VIX e.g.) was a low 15. Today the VIX is in the mid 20’s and growth forecasts are being reduced. Now let’s take a closer look at what will drive changes in these forecasts going forward. The combination of extraordinary behavior by central banks in lowering interest rates (Figure 1) combined with the fiscal policies of the G20 with regard to global stimulus packages over the past two years led the world from the brink of calamity to recovery. Source: Board of Governors of the Federal Reserve System. Date: March 31, 2010. Figure 2, shows the massive response to the stimulus package in the U.S. and highlights its ebbing effects in the second half of 2010 and all of 2011. Source: Goldman Sachs Global ECS Research. Date: December 7, 2009. Importantly, the expiration of the Bush tax cuts means there will be an increase in the personal tax payments in 2011 of $160 billion or so which is about 1% of GDP for the year as a whole.3 Steven Whiting of Citicorp speculates this could have the effect of reducing 2011 GDP by more than two percentage points if no changes are made by Congress by year end. In 2009, lower interest rates and rising earnings led to a huge equity rally, with stock prices growing nearly 70%. To sustain this market level, however, will require a transition from a recovery led by government stimulus and inventory restocking to one led by the private sector. That means jobs and income must grow. If we do not create more employment, and if the employed do not have more income, we will have done little besides giving a drunk another drink. We will have piled debt upon debt with little to show for it. We will have used the “spare tire” to which El-Erian refers, which is why the May jobs number was so disappointing. The following pages discuss five quantitative touchstones – economic indicators, sovereign debt issues, monetary policy and deflation, the Euro crisis, and China – that will determine the nature of global and domestic growth in the months and years ahead. Economic IndicatorsU.S. Leading Indicators peaked in March and have begun a descent (Figure 3). The Economic Cycle Research Institute’s (ECRI) leading indicator index looks ahead six months and is suggesting annual GDP growth of around 1.5%. The historical correlation between stocks and leading indicators is powerful and appears in Figure 4. The ECRI bottomed this cycle four months before the equity market did, and kudos to those investors who paid attention. Source: Wolfe Trahan & Co. Portfolio Strategy. Date: May 24, 2010. Consumer spending has improved, but the first quarter growth can be almost completely explained by the drop in the savings rate as pointed out by Martin Feldstein in a recent Wall Street Journal article. Consumer frugality will return without job growth. Housing looks iffy as well. Mortgage applications fell 36% in May, a second decline albeit from an artificially high level in April reflecting the expiration of the government’s mortgage support program. Figures 5 and 6 suggest any pickup will be slow. Source: Haver Analytics, Gluskin Sheff. Date: May 27, 2010. If one approaches the construction of GDP as the sum of C + I + G + (X-M), it is hard to see how growth can come close to the forecasts of many pundits. Consumption (C) is now 71% of GDP, and this will rise but by how much? Investment spending (I) consists of both business investment (capital spending) and residential investment. With low operating rates and a slowing global growth rate, this number may also rise but it will be modest. Government spending (G) will actually be a drag next year without additional stimulus plans. And this forecast includes the effects of the end of the Bush tax cuts. Net exports (X-M) will certainly be less than expected a few months ago given the appreciation of the dollar and a general lowering of demand from abroad as the global economy slows. Sovereign Debt Issues In Reinhart and Rogoff’s book, This Time Is Different, the authors show that when debt levels reach 90% of GDP, a country’s real economic growth rate becomes stunted; on average, future growth is lowered by 100 basis points per annum. The debt level of many countries in the developed world is already at 90% of GDP, as illustrated by Figure 7, which shows a matrix of the fiscal deficit to GDP plus the level of government debt to GDP. The lower right quadrant is where problems are acute. Source: Epoch Investment Partners, Inc. Date: May 2010. Figure 7A portrays the same point from a different perspective. Source: OECD, Independent Strategy. Date: June 2010. With respect to the U.S., Figures 8 and 8A show total credit market debt as a percent of U.S. GDP from 1916 through 2008. Note the surge in credit/GDP that began in 1980. Without question, this surge in debt aided the growth rate of our economy. It appears as part of the “productivity effect” mentioned earlier. The slope of this line will be much shallower after 2010. Source: Bureau of Census, Historical Statistics of the United States. Date: June 2010. Source: Strategas. Date: May 2010. Monetary Policy and Deflation In a recent article entitled “As Mercantilism Dies,” Russell Napier of CLSA points out that some central banks are finally seeing that keeping credit growth in tandem with GDP growth is a key to a steady economy. Inflation targeting simply ended up provoking credit binges in the West while exchange rate targeting made asset policies volatile in the East. His conclusion is that Asia will attempt to diffuse the impact of credit coming their way via the continued easy money policies of the West by moving away from an exchange rate targeting mechanism and toward a credit targeting mechanism, with Asian equities underperforming as a result. Figure 9 illustrates this 30-year credit binge in the U.S.
We have socialized the losses in the banking system and have taken the bad debts in the private sector and transferred them to public sector balance sheets. We had little choice at the time of the crisis, but the consequence will be lower economic growth rates as we work the debt down. Basically, we transferred the debt to entities with theoretically infinite lives (sovereign nations) from holders with finite lives (individuals and banks). In other words, we extended the duration of the debt problem by decades. The Euro CrisisGreece was the proverbial canary in the coal mine. CDS spreads suggest the market is now applying 45% odds that Greece defaults within the next five years. The country had already restructured no fewer than five times in the past 200 years. After Greece’s upheaval, contagion risk quickly spread throughout Europe, forcing the ECB to propose a rescue package with help from the IMF. These deficit-financed social welfare states cannot continue to expand. Just look at Figure 10 and see the trends. Greece may be the worst but Euroland as a whole now exceeds Rogoff’s 90% level in which future growth rates wilt under the pressure of servicing the debt burden. Source: EU Commission, Morgan Stanley Research. Date: May 27, 2010. An even better picture of the potential contagion effect is shown in Figure 11, borrowed from The New York Times. This is indeed a chart worth 10,000 words! One needs to be 100% sober to follow the arrows and to appreciate the full magnitude of the implied pressure on the Euro banking system. Source: The New York Times. Date: May 1, 2010. The Economist, in their June 5th edition, had an interesting article discussing where European banks sit on the financial Richter scale. They highlight three unsettling gauges. The first is the level of LIBOR, which has doubled to 50 basis points in a short period of time, with Citibank analysts speculating it will reach 150 basis points as markets price in the risk associated with banks taking losses on their holdings of government securities. Futures markets are headed for a possible doubling by year-end, as well. The second concern is the widening of the spread between LIBOR and the OIS (the relatively risk-free rate known as the overnight index swap). Although low in absolute terms at 0.3, it has tripled in May, suggesting banks are hoarding cash rather than making it available on the interbank market. The third and final signal is the CDS market. CDS spreads on even the biggest banks in Europe have surged recently. Many European banks have been slow to recognize losses on private sector assets. The ECB recently estimated Euro zone banks would take 123 € billion of charges against losses this year and a further 195 € billion through year-end 2011. All in all, this is not as terrible as it may seem, as the banks can borrow from the ECB and then invest proceeds in higher yielding government bonds. It is estimated that this carry trade may account for as much as 40% of the profits posted by smaller banks and even 20% at larger ones. As The Economist points out, Europe dodged a big crisis this spring but “it still lacks resolution regimes for failing banks, needs a plan to wean firms off volatile short term funding, and should publish stress tests on individual banks” as America did. Until then, these three gauges will determine whether the European banking system is improving or worsening. Two recent essays captured the problems that exist with the Euro and the EU from the standpoints of both design and culture. We recommend both pieces to anyone who wants more detail on the topic. Whatever remaining optimism existed for Europe at the start of the year is now rapidly eroding. Fiscal restraint, little growth in the work force, and signs of instability in the banking system strongly suggest both economic growth rates and profits will be revised downward in coming months. ChinaChina has been the marginal buyer of almost every good manufactured in the world for some time. However, we are now past the peak of the worldwide inventory cycle, with the Chinese PMI slipping to 53.9 in May from 55.7. The warning bell for China may well be the Australian dollar. It is down just under 7% since the end of April, possibly reflecting a peaking of economic activity in China, Australia’s most important trading partner. With their currency pegged to ours, China’s monetary policy is also our own. But what may be right for us is clearly wrong for them. Inflation is soaring there. The minimum wage scale has been raised 20% in many parts of the country. Strikes have occurred at Honda and other foreign-owned plants in China. Whereas the velocity of money in the U.S. remains moribund, it has soared in China and produced inflation (Figure 12). A massive property bubble has ensued and the government is trying to put the brakes on it. It is naïve to believe one can contain this bubble without its effects spilling over to the real economy. Source: China Economic Information Net, Bloomberg. Surprisingly, China’s bank credit/GDP is more than that of the U.S. and more than twice that of India and Brazil (Figure 13). A 10% growth of credit equates to a 6% growth in India and Brazil. However, 13% in China begets credit growth of 30% per year. Source: IMF, Independent Strategy. Date: March 2010. Source: Independent Strategy, DataStream. Date: March 2010. Source: WTO, Independent Strategy. Date: March 2010. We have spent the past dozen or so pages enumerating the abundance of problems at the macro level of the global economy. But it is now important to take a look at the micro picture. The fact is that few major issues exist at the corporate level. Corporate balance sheets haven’t been stronger in almost 50 years. In its recent Q1 Flow of Funds data, the Fed reported that the non financial corporate sector has built up its cash board to a record $1.84 trillion – up 26% from a year ago. Goldman Sachs estimated that cash as a percent of total assets of non financial companies at the beginning of 2010 was 9.7%: a record high. From the perspective of corporate leverage, things are also looking up. Debt to equity ratios for the non farm, non financial sector fell to 55% from Q4’s 57% and are far below the cycle high of 80%. The ratio of long term debt to total debt reached 74%, a new high as bank lines were further decreased. Corporate liquid asset ratios rose to 51%, the highest since 1956. As a result of these strengthening fundamentals, we expect corporations to increasingly allocate cash flow to dividends and share repurchases. So far this year, more than 100 companies of the S&P 500 have raised their dividends and share buybacks have come in at over $53 billion, up 23% from the same period a year ago. With limited global growth prospects, M&A activity should pick up as firms elect to acquire other firms in order to grow. The foregoing discussion suggests we are in for a period of lowered expectations of real economic growth with equity markets characterized by greater than normal volatility. This combination of lower expected growth combined with a greater dispersion around that expectation indicates the market will “clear” at a lower level than the current one. In effect, a higher risk premium will be applied to markets with these twin characteristics of slowing growth prospects and increased volatility. The real question for the investor is how much of the above is already priced into the market. In the short run, not enough; but in the intermediate term, quite a bit. Notwithstanding the aforementioned macro challenges and the lingering specter of inflation, stocks should beat bonds handily over the intermediate and longer term periods. Why? Because cash flow yields from equities today generally exceed bond yields by a multiple of two or three to one, and many of these cash flow yields have growth rates associated with them unlike bond coupons (see Figure 14). Moreover, the volatility inherent in equity markets over the short term dissipates with duration. The five year VIX for stocks is less than that for one year, and the ten year VIX is less than that for five years. This is why holding periods matter. The longer the holding period, the lower the VIX for stocks relative to bonds and the greater the chance the mean return expectation for equities exceeds that for bonds. Source: Picton Mahoney, Federal Reserve Board, Corporate Reports, Empirical Research Partners Analysis. Date: May 2010. Importantly, it is worth remembering what equities capture relative to bonds and most other asset classes. Equities ultimately are a hedge against inflation, and their ability to capture economic productivity is reflected in corporate earnings growth. When inflation does accelerate, it is true that P/E ratios will decline. However, earnings will eventually reflect the rising inflation scenario through higher earnings offsetting much if not all of the P/E ratio decline. Similarly, when output per man hour is rising and labor costs per unit of output are flat or falling, productivity soars. Equities capture that phenomenon better than almost any other asset class. An excellent illustration of these two points appeared in an essay in the May 28, 2010 issue of Grant’s Interest Rate Observer, entitled “Buy Beer, Sell Bonds.” Jim Grant begins with the comment that, when no one is looking, Mr. Market “sticks the ‘risky’ label on the ‘safe’ asset, and the ‘safe’ label on the ‘risky’ asset.” Simply put, price determines what is risky and what is safe. “Anyone who prefers the Treasury 3.5s at a yield to maturity of 3.16% over Molson Coors common stock at an earnings yield of more than 9% is tacitly registering the view that the crisis of the euro will not diminish the standing of the paper currencies as a class and that interest rates, which have been falling since 1981, will keep on falling.”9 What’s more “…Molson Coors is trading at four times the 10-year Treasury, plus you get inflation-based growth.”10 The writer also provides a chart of beer prices (see Figure 15 below) to illustrate his point. So, ten years from now, which asset is more risky at today’s price: the bond or the beer company? We agree with the writer. Beer will outperform bonds. Generally speaking, equities will beat bonds from this point forward so long as the owner’s holding period reflects something other than the short term, and deflation does not become an enduring economic phenomenon. Source: Grant’s Interest Rate Observer, May 28, 2010. With risk premia higher, we believe stock selection is more important than ever. Specifically, it will pay to concentrate on those firms with: 1) above average free cash flow yields, 2) prospects of growing those yields and, 3) an absence of significant debt obligations. Source: Wolfe Trahan & Co. Quantitative Research. Date: April 2010. Many of these investment candidates will be large global franchises that pay dividends (i.e. cash, share buybacks, and/or debt pay downs), are defensive in character, and have elements of low to moderate cyclicality. And they have almost never been cheaper. Given the headwinds faced by today’s investor, patience is required, but it will be worth the wait. Those who see the value of equity investing in today’s marketplace will be rewarded with an unparalleled inflation hedge, free cash flow that compounds annually at a high single digit rate, and an ability to capture productivity gains even in environments with rapidly changing outcomes and expectations. 1The ticker symbol for the CBOE Volatility Index which shows the market’s expectation of 30-day volatility. It is constructed using the implied volatilities of a wide range of S&P 500 index options. The VIX is quoted on an annualized variance basis. 2Jeremy Grantham, another well-respected investor, goes about deriving his forecasts somewhat differently. They appear in the box below. The big difference between his estimate and ours is his forecast for P/E multiple contractions. One can invert the P/E to obtain the earnings yield, E/P, which is a measure of the equity market’s discount rate. We would disagree with his assumption that the likelihood of P/E contractions is simply based on reversion to the mean. In our view, the reciprocal of the P/E ratio is not the appropriate measure to discount a future stream of estimated returns. Discount mechanisms look forward not backward. Schiller’s CAPE ratio (the Cyclically Adjusted Price Earnings ratio), Grantham’s preferred tool, is interesting but it is an historical artifact. No CFO would use the inverse of that ratio to measure the cost of capital if he were allocating capital to projects or acquisitions. Rather, it makes more sense to us to start with the risk free rate and then add basis points for the various elements of uncertainty surrounding the project, the company, the industry and so forth. Source: Jeremy Grantham Guarantees Gold will Crash, Advisor Perspectives, Date: May 18, 2010. 3Steve Whiting, Citigroup Economic and Market Analysis, April 29, 2010. 4Independent Strategy, March 9, 2010. 5From Recession to Recovery: How Soon and How Strong, IMF World Economic Outlook, April 2009. 6Dr. Ed’s Weekend Briefing, Yardeni, May 21, 2010. 7“Conclusion – Star Trek Remembrances And – The Unsolved Rubinstein Homicide,” The DeVoe Report, May 13, 2010. 8Sovereign Discredit, Independent Strategy, March 9, 2010. 9“Buy beer, sell bonds,” Grant’s Interest Rate Observer, May 28, 2010, Vol. 28, No. 11, p. 2. 10“Buy beer, sell bonds,” Grant’s Interest Rate Observer, May 28, 2010, Vol. 28, No. 11, p. 3. 11“Profiting from the Abundance of Corporate Cash,” Wolfe Trahan, Quantitative Research, April 14, 2010.